We’re coats off and we’re settled in, poised to experience 'The Best' – a play by Maureen Lipman's late husband Jack Rosenthal when moments before the lights dim; a Lass O’Gowrie performance room employee saunters over with her gaze pointing my way and announces 'You're sat in the love seat’, naturally I start laughing (nervously), is this part of the play I wonder, what’s a love seat? Maybe she’s talking to someone else, I point a finger towards my chest for unwelcome clarification 'Yes you’ she added ‘you’ll have to move’. I glance around the bijous venue for a suitable replacement with increasing anxiety, the place is jammed; we are packed in like Biscotti. The only vacant pew on show looks more like a milking stool and the more I stare at it - the smaller it’s getting! To make matters worse the puny pew is practically on the stage, and I mean - so close; you can feel the actors’ breath! Thankfully none of the cast had prepared for the show by going on a George Best style bender so relocation accepted; i decide to adopt the mindset that the action’s more of a thrill if you’re right up close. A life played out in the tabloids and permeated with mind boggling peaks followed closely by heart wrenchingly miserable troughs. This is a great venue for feeling like you’re actually in the show. Director Colin Connor makes the most of this room’s unguarded characteristic with his intense shows as did comedy drama ‘Together in Electric Dreams’ directed by Daniel Thackeray which appeared here as part of the Manchester Science festival back in October. 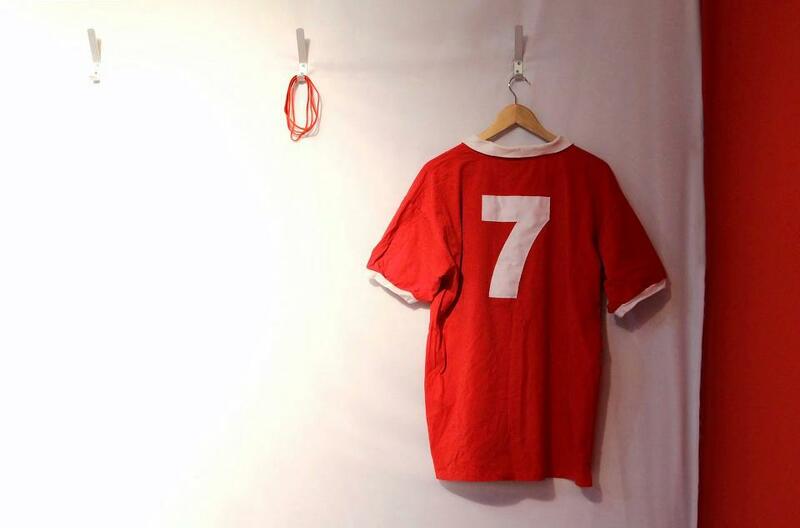 ‘The Best’ gives us a tantalising glance into some of George Best’s darkest moments in a life played out in the tabloids and permeated with mind boggling peaks followed closely by heart wrenchingly miserable troughs. Ben Patterson plays George and there’s no denying he does a great Best, he makes it look easy, his accent's a…mazing as you might expect from the Bangor born boy and he captures George’s unkempt look and likeability. Nod to the wardrobe department - it's always nice to see Fila representing and the Sergio Tacchini trackie top getting a run out reminding us of an era when they were inspirational brands. Charlotte Dalton plays Angie Best, George’s long suffering wife, and she probably gets the lion’s share of the dialogue; mostly in conversation with a newly acquainted journalist and unsurprisingly willing confident Carole Danziger portrayed by Hannah Ellis. Carole’s there (at first) for the big story and taps away at Angie’s brittle façade until the worn out wife shares intimate details of how her and George met and fell in love. All the while George has checked himself into a rehab facility on the other side of the world for a 30 day detox in a vain attempt to clean up his act. 6 hours in and George is a crumbling mess - in a world of pain - and that’s before they stick him in the love seat! Yes, it turns out the love seat is the cruel to be kind - kind of love seat. Imagine being subjected to the most honest roasting of your life whilst detoxing of the drink with no family or friends for support and your in the right ball park. It’s quite a lengthy show at almost 2 hours including the break but it is 2 hours well spent and i urge you to go and see it, they're a talented bunch of actors rolling with a great script and you do get the impression they realise they’re part of something special. Such is the demand to see the show and capacity restrictions that the Manchester shows have sold out although Press officer Debbie Manley suggested there would be more dates added and a run to follow at the Bolton Octagon.